The Ma'asim Tovim Award is the highest recognition a Region can give to one of its members. It is usually given to individuals who have worked on behalf of the region for many years. It is presented at the FJMC Convention. The 2015 honorees are set forth below, as well as short bios and why they are to be so honored. Their awards were presented at the 2015 Convention in Miami Beach, Florida. To really understand the impact our past honorees have made on FJMC members in their communities and regions, watch this video. To see the ads that sponsors submitted, view the tribute journal. Rabbi Sirull was born and raised in South Florida. He attended the Hebrew Academy of Greater Miami and Mesivta High School on Miami Beach. Rabbi Sirull studied at the Rabbinical College of America and was ordained by the Rabbinical Seminary International. He is a member of the International Federation of Rabbis, the Atlanta Rabbinical Association, the Greater Carolina Board of Rabbis, the Coalition for the Advancement of Jewish Education, the Jewish Ministers Cantors Association, the Guild for Temple Musicians, the Jewish War Veterans, the Jewish Historical Society, and is an active member of the Rotary International. He currently serves on the Augusta Jewish Federation Board of Directors, the Augusta Country Club Board of Governors and the Richmond County Hospital Authority. He is known as an exponent of authentic and traditional synagogue music and has appeared in programs internationally. His works include musical compositions for the Sabbath published by the Cantors Assembly. In 2014, he released his third CD, which was recorded and produced in Nashville. He is also a leading Jewish performer on YouTube and has had several viral hits. He is the author of the book “And You Shall Teach Your Children”, and was a recipient of the Jewish Commissions Instructor of the Year award. Rabbi Sirull is responsible for the formation of the Men’s Club in Charleston as well as the one in Augusta. He has served as scholar-in-residence and artist-in-residence at numerous Men’s Club conferences. He enjoys playing golf, camping, fishing and motorcycling. The rabbi’s wife Stacy, is a nurse. They have two daughters, Sara and Devorah and a son, Sidney. Don Miller was born in Manhattan, NY, and raised in Yonkers, NY and Ferndale (Liberty), NY. He graduated from Yonkers High School in 1962 and from Westchester Community College in 1964 (AAS in Engineering Science). In 1964 he traveled to Lawrence, Kansas to attend the University of Kansas where he met the love of his life, Regina. They were married in 1967. From 1965 to 1969 Don served as Jewish Chaplain’s Assistant in the United States Air Force – serving in the Philippines and Texas. Returning to the University of Kansas in 1969, he completed his BA (1970) in Economics, MA (1972) and in Human Development, and PhD (1974) in Child and Developmental Psychology with an emphasis in Behavior Analysis. Don began his career as a psychologist with the State of Connecticut – first at the Southbury Training School and then with the North Central Region of the Department of Developmental Services. Don retired from the department after 27 years of service. Following retirement, Don continued his work in community organizations. Don has served as President of the CT Chapter of the American Association on Intellectual and Developmental Disabilities (AAIDD) and currently serves as Treasurer. Don also serves as Secretary-Treasurer of the Northeast Region X of the AAIDD. He is a Past President of the Probus Club of Greater Hartford. 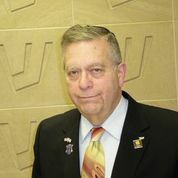 Don served as President of the Connecticut Valley Region of the United Synagogue of Conservative Judaism (USCJ), serving on the USCJ Council of Regional Presidents, and the USCJ Board. Currently Don serves as Co-Moderator of the USCJ Presidents List. Don has served as President of the Jewish Children’s Service Organization and chaired its Projects Committee. Don is a Past president of The Emanuel Synagogue (West Hartford, CT). He currently serves as Co-Chair of the Emanuel’s Ritual Committee and President of the Emanuel Brotherhood and is a past President and current Treasurer of the CT Valley Region of FJMC. Besides volunteering, Don enjoys opportunities to spend time with their granddaughter, stamp collecting, engaging in continuing Jewish learning (recently completing the JTS 2 year CONTEXT program) and leading trips to Israel. Jeffrey Litt recalls as a young boy in Hebrew School, meeting his Dad when class was over and grabbing a bagel with lox with him at Men's Club breakfasts at the Huntington Jewish Center, on Long Island, in New York. Twenty-five years later, Jeffrey's children were in Hebrew School at Congregation B'nai Israel in St. Petersburg, Florida and history repeated itself...L'dor V'dor. Jeffrey joined the CBI Mitzvah Men's Club and became involved in many programs and events. He volunteered yearly to erect the Sukkah, chaired many Men's Club Shabbatot, and accepted the position of Men's Club Vice President followed by club Presidency. Under Jeff's leadership, many new events and programs were launched with membership and involvement was at an all-time high. Jeffrey was honored as Men’s Club Man of the Year in 1999 and as Congregation B’nai Israel’s Hatan Maftir for Simchat Torah in 2004. Jeffrey was introduced to the FJMC when brought to a Florida Regional meeting in Orlando around 1995 or 1996. He became involved in the region as Communications Chair, reviving the regional newsletter, Tapuz. Through his outstanding efforts, he attracted a team of men to the International Convention, most of whom have risen to significant roles in FJMC, thereby initiating advancement of the Florida Region from a place of sleepy retirement to the active and respected level it has achieved today. In fact, Jeffrey has not missed an International Convention since. He as attended several Gefen LDI training weekends, became a Regional Vice President, Ritual Chair and President of the Region, leading it through several firsts, including retreat, a man of the year program and hosting of international convention. He has been an FJMC Regional Advisor and has held several roles at the International level including the Convention Daily News Editor, Tribute Journal Chair & Co-chair, Program Fair Chair, and, "e-mail" blaster" (Beantown Lowdown). He has served as an FJMC President’s Advisor, E-Torchlight (the predecessor to HaShofar) Editor and Fund Raising Committee member. Jeffery continues a lifelong history of volunteering. He served for over 20 years in many levels of Boy Scouting starting as a Cub up to and including to Troop and District leadership. Jeffrey has served in the Coast Guard Auxiliary and in his neighborhood civic association as a board member and chaired, communications and neighborhood watch committees. He participated in the public school’s advisory committee and with the Pinellas County Jewish Day School. Jeffrey is a synagogue activist having taught introductory Hebrew reading, conducted High Holiday ritual review and created an adult education class exploring the siddur. He leads services and has served many years as Baal Tikiah (shofar sounder). Jeffrey is a pharmacist licensed in Florida and New York State with 35 years of experience including retail, hospital and long term care. He graduated from Long Island University's Brooklyn College of Pharmacy. He enjoys bi(now tri)cycling, kayaking, aquarium keeping, motorcycling, classic car restoration, boating, electronic and computer tinkering, woodworking and furniture building. Jeffrey has been married to his best friend, Diane, for thirty years. They have three children, Stephan, Jaclyn (married to Andrew), and Joshua and a granddaughter Alana. They live in Saint Petersburg, Florida with their pets (many of which are dogs rescued from various sources). Richard was born and raised in the Bronx with two great parents and a brother. He graduated from Pace University with a bachelor’s degree in public accounting. He spends most of his professional life working in data privacy which he got into through a chance conversation with his now partner (who at that time was only a network associate). Richard became active in Brotherhood when he was asked after having, at best, marginal participation in his first two years at Temple Israel Center. When he first became Brotherhood President,the task was daunting as he had never been a leader; he was the man behind the scenes keeping the books, but like an early Moses, not even remotely able to speak in public even after taking a public speaking class. He recalls his first sermon was more than a bit nerve wracking – luckily, the podium prevented anyone from seeing his shaky legs. He is proud of his growing self- confidence, learning to be an effective leader and delegator, encouraging others to assume leadership roles of which he is most proud, and becoming a better and more engaged listener – all of this he has brought to his business pursuits. During his tenure as President, the club became widely recognized by the clergy and board for its innovative programs, many of which have received Torch Awards. He also served on Temple Israel Center’s budget committee for over 10 years and learned that there is more to Synagogue budgeting than just crunching numbers. Each year they have refined the process and improved upon the past, and more importantly have shared several practical and innovative suggestions with the Executive Committee. Richard is a past President of the Hudson Valley Region of FJMC. He is most proud of reinventing the regional website and improving club communications and attendance at regional meetings by modeling their format into a HMV style. Currently, Richard is working with EVP of the Hudson Valley Region, Rob Levine, on a networking fundraising project for FJMC. It capitalizes on the collaborative ideas of Ron Wolfson, many of which Richard regularly has been employing for years in his businesses. Richard has been active in FJMC since attending his first convention in 2005, at which time he had just become club President. He has attended several LDIs, and in the last three has been chairing or co-chairing various tracks. One of the highlights of convention is in sharing the excitement with first-time attendees when they witness what FJMC is really all about – in freely sharing ideas and information so that every club can be the best it can be. He is thrilled to be honored by the Hudson Valley Region and extends a "Yasher Koach" to all the Ma'asim Tovim honorees. Murray has served his Men’s Club as president in 2 separate stints. He was chairman of the Cleveland sub-region and a vice president of the then Great Lakes region. He has held many positions in his synagogue. He was the last president of Congregation Beth Am when it merged with B’nai Jeshurun Congregation. It was a bittersweet task in which he helped ensure today’s synergistic result. In the community, Murray serves on the board of Cleveland JNF, volunteers in maintaining the garden at The Gathering Place, a cancer wellness center, and is on the alumni board of the CWRU School of Dentistry. For the past 25 years he has been chairman of the Jaffee Scholarship Fund of the Columbus Jewish Foundation for needy Jewish dental students at The Ohio State University. Professionally, Murray is a general dentist with a private practice, is on the staff of two hospitals and CWRU school of Dentistry and is a Fellow in the Academy of General Dentistry. Personally, Murray was married to his college sweetheart, Beva, for 30 years. She passed away 12 years ago. He again found love, seven years ago, with a new partner, Mary, and between them they have five children and five grandchildren. Judaism is central in Murray’s life. He expresses it through items such as his yearly Passover Quiz, which he has produced for the past 33 years. The publication provides humor and knowledge to spice up the Seder and enrich the Jewish experience. For Murray, being a part of the Men’s Club has enriched his Jewish experience by allowing him to be himself in expressing his ideas and pursuing his interests, by bringing him together with dedicated men who have become lifelong friends and by helping him to serve his synagogue community in a meaningful way. Neil Melman was born in Rochester, NY, March 19, 1945. He graduated from State University of New York College of Environmental Science and Forestry - Bachelor of Landscape Architecture, 1967. Employment history: New York State Dept. of Transportation 1967-1969; Cannon Design 1969-1972; City of York (Toronto) Parks and Recreation Dept. + Planning Dept. 1972-1997; City of Toronto City Planning Dept. Urban Design Section 1997-2009. His varied career avenues in Landscape Architecture have included park and playground design, commercial, industrial and institutional design, urban design and city planning. Neil was married in 1968 to Ellen Jonas, the love of his life. They have two children and three grandchildren. Their son, Aaron, is married to Elisa Rotman of Worchester, MA, and they have two children - Jordan and Hannah. Aaron is a rabbi at Congregation Beth Shalom in Northbrook, IL. Their daughter, Ora, is married to Ryan Leopold of Toronto and they have a little boy - Dylan. Ora is an elementary school teacher. Neil has been a member of Adath Israel Congregation since July 1968, and a member of the Brotherhood for several decades. He served as club president and Lake Ontario Region regional president. He has been very active in club and regional programming, including running more than a half dozen retreats. Those who know Neil know that he would rather spend his time roaming around the bottom of a lake or ocean watching fish and exploring shipwrecks, something he has been doing since his teenage years. Richard G. Racusin was born and raised in Corpus Christi, Texas. (Yes. there is a Jewish community in the Body of Christ.) He was educated in the Corpus Christi Public Schools, Del Mar College, the University of Texas at Austin, and the University of Michigan in Ann Arbor. Richard attended B'nai Israel Synagogue Religious School through the 12th grade and was recruited to teach in the Sunday School. Richard wasa member of Boy Scout Troop 218, sponsored by the Jewish Community Center. Richard also participated in Young Judea. Richard received a Bachelor of Arts in Chemistry from the University of Texas and a Master of Science in Analytic Chemistry from the University of Michigan. Richard was active in the Alpha Phi Omega Service Fraternity chapters at both the University of Texas and the University of Michigan. Ellen and Richard met at the Ann Arbor Hillel Foundation and married in the Summer of 1972. They immediately joined Congregation Beth Shalom (CBS), Oak Park, Michigan, a middle sized conservative congregation. They have a daughter, Debra, married to Doniel Jelen, and five and children in Israel, Chana, Shmuel Yoseph, Ester, Yehuda Zev, and Mordecai Tsvi; and a daughter, Judith, an astronomer-astrophysicist at NASA Goddard Space Center, Maryland. Richard and Ellen have made 11 trips to Israel. Richard also participated in the 2006 Men's Club Mission. After their wedding, Richard worked for Chrysler Corporation. Subsequently, he joined Construction Consultants, Inc. (CCI) to become a Materials Specialist in Roofing Technology. CCI evolved into Building Technology Associates, Inc. (BTA). Richard retired after 34 years. At CBS, Richard initiated the Shabbat and Festival morning usher committee and cochairs the High Holiday Usher Committee. He serves on the Building & Maintenance Committee and Audio Systems Committee, both of which he has chaired. In 1982, Richard joined the Men's Club when requested to automate the men's mailing list of the congregation on his home computer. He served as Secretary, Treasurer and eventually Club President. He was also a congregational Trustee and Officer. As a Past Club President, he became active in the Michigan Sub-Region of the (first) Great Lakes Region, attending Region Conventions and Retreats and serving as Region Chairman. He was elected to a Region Office and eventually Region President. He started attending International Conventions. The Miami Beach Convention will be his 13th convention, Ellen's seventh. Richard is currently Treasurer of the Beth Shalom Men's Club and Secretary-Treasurer of the (current) Great Lakes Region. Richard also coordinates Yom Hashoah Candles for his club and Region. Richard also coordinates, and occasionally cooks, the Simchat Torah Men's Club Cholent Lunch Cookoff. Richard and Ellen were honored with the Jewish Theological Seminary Shin Award in 1998. Richard was recognized as the Beth Shalom Men's Club Man of the Year in 2003. In the Fall of 2009, the Congregational President requested that Richard coordinate Minyan Breakfast when the Ritual Director took medical absence. This evolved into coordinating morning and evening daily MInyanim when clergy are not present. Richard and Ellen also shop and prepare food of Shabbat, Festivals, and special events. An active member of Beth Sholom Congregation for over thirty years, a successful consultant, a loving husband and father of three, Michael Weingram is the epitome of the Federation of Jewish Men’s Clubs (FJMC) goal of, “Involving Jewish men in Jewish life.” Michael has spent many years in the service of his Congregation, its Men’s Club and the FJMC. The relaxed and natural willingness with which he has done so has been a source of both pride and inspiration to his fellow congregants, Men’s Club members, his family, and his friends. Michael is this year’s recipient of the Middle Atlantic Region’s prestigious Ma’asim Tovim Award. On Sunday, December 7, 2014, Michael was honored by the Federation of Jewish Men’s Clubs, Middle Atlantic Region, together with Men’s Club “Man of the Year” honorees from other congregations in the region. Michael has been a dynamic member of the Men’s Club and its Board of Directors for over twenty-five years, generously giving his time and energy to the various social, education, charitable and religious activities of Men’s Club. His enthusiasm and humor is infectious. Michael is a Past President of the Beth Sholom Men’s Club, having led our club with dignity and distinction. He has been a stalwart of the FJMC Mid-Atlantic Region for over twenty years. He worked his way up the ladder of leadership to become the Region's President 2002-2004. He is also known for all of his behind the scenes efforts on behalf of the FJMC Mid-Atlantic Region and is currently involved with National FJMC programs. Michael was the chair of the FJMC Golden Kippah Youth Campaign Committee, which raises funds to provide both scholarships and capital needs for Camp Ramah in the Poconos. He has made a significant contribution to the growth of our Men’s Club and to the development and growth of the FJMC MidAtlantic Region. He attributes his enthusiasm for Men’s Club to the joy of seeing men engaged in activities that strengthen their commitment to their families and the Jewish community. Michael is one of the beloved volunteers at Beth Sholom who gives his time and energy to support and help our community grow. Currently he is Co-chair of the congregation’s Religious Life Committee and the Co-chair of the High Holy Day Greeters. He is a past chairperson of the Congregation’s Youth Commission, a past member of the Youth Scholarship Committee, a past co-chair of both the Honors and Memorials Committee and a past co-chair of the Torah Dedication. He has also served as the Mid-Atlantic Representative on the Board of Directors for Camp Ramah in the Poconos. He and his lovely wife, Eileen, have actively supported USY at Beth Sholom and in the USY Hagesher Region, and as volunteers at International USY conventions. They are joint Ateret Kavod Award winners for their efforts in supporting Jewish education and camping. For many of the young families at our synagogue, something would be amiss if they did not see Michael working at the Purim Carnival, Tot Shabbat dinners or other preschool activities. Michael grew up in Northeast Philadelphia in a household with a strong work ethic and a commitment to Judaism. He is a graduate of Central High School (225). He received his undergraduate degree from Penn State University and his Master’s degree from Temple University. Professionally, he is a consultant to non-profit organizations, families and individuals developing housing for people with disabilities. He is the Chairman of the Board of Directors of SpArc Services, an organization that provides support services to adults with intellectual and developmental disabilities. Michael and Eileen take much pride in their wonderful children, Jason, Ivy and Josh Weingram, and Abbye and Josh Cornfield. His new joys are his grandchildren – Nathan, Jacob and Oren. Michael credits his children with inspiring him to become more active in the life of our synagogue since they already were spending much of their time in the Hebrew and Nursery Schools. And, of course, he credits Eileen, who with everything else that she does, has been able to hold the fort at home while he was spending chunks of his time over the years engaged in synagogue and Men’s Club activities. He is devoted to his family and continuously exhibits the traits of integrity, understanding, warmth and responsibility both at home, at work and at Beth Sholom. His synagogue cannot function without the hard work and dedication of its many volunteers, and Michael has been a role model for the entire Beth Sholom community with his hard work and dedication to his Men’s Club, his Congregation and his family. In recognition of his exemplary volunteer work as well as the energy and with which he brings to his volunteer service, the Beth Sholom Men’s Club was pleased to honor Michael as their Man of the Year at Adath Jeshurun on December 7, 2008. Today he is being honored as the Middle Atlantic Region’s Ma’asim Tovim honoree. Sandy Victor was born in Madison, Wisconsin and lived there until he was eight. He spent the rest of his formative years in Milwaukee. Sandy studied engineering at the University of Wisconsin-Milwaukee, receiving his BS and MS degrees in 1974. He took a break during his sophomore year to join the US Air Force Reserve, where he served for six years. After graduation, Sandy moved to the Chicago south suburb of Park Forest to begin a career in the refinery and petrochemicals business. He worked for Atlantic Richfield, Amoco Oil Company, and is currently with UOP. During his career he worked in the areas of process design, project engineering, research and development, and heat transfer equipment. In addition to engineering, Sandy began studying hypnosis after graduating college. After years of practice, he became a Certified Hypnotherapist by the National Guild of Hypnotists in 1992. Sandy's hypnosis practice is geared to helping individuals deal with or overcome a wide variety of issues. After moving to Chicagoland, Sandy met Marilyn, a native of the south side of Chicago. They were married in June, 1976. Sandy and Marilyn have three children: Jeff is an illustrator living in Los Angeles; Debbie is a pediatric occupational therapist in Chicago; and David is a middle school orchestra teacher in the far northwest suburbs. Sandy had his Bar Mitzvah at Beth El Ner Tamid in Milwaukee. He was active in both AZA and USY in high school. After moving to Buffalo Grove in 1986, Sandy and Marilyn affiliated with Congregation Beth Judea. Almost immediately, Sandy joined the Beth Judea Men's Club that was just restarting and rebuilding itself. He got involved in many of the Men's Club projects around the shul, such as landscaping, building a handicapped access ramp to the bima, paneling the Bet Hamidrash, and designing and building the synagogue's sukkah. He served on the Men's Club Board of Directors for about 25 years, including terms as Secretary, Vice President of House, Vice President of Ways and Means, First Vice President, and eventually, President. At the same time, he served on the shul's Board of Directors for over twenty years, including terms as Facilities Vice President, Ritual Vice President, Parliamentarian, Constitution Committee chairman, and co-chairman of the Rabbi Search committee. After serving as the Beth Judea Club President, Sandy got involved with the Midwest Region. He served as Secretary, Vice President for several terms, Executive Vice President and President in 2006-2008. The highlight of his term was being President during the FJMC Convention in Chicago in 2007. Upon completing his term as regional President, Sandy got more involved in the International FJMC. He has served as chairman of the World Wide Wrap, Quality Club Award, and the Training Reference Materials committee, which updated the Club and Regional President manuals. Sandy loves traveling. He has been in all 50 states and 27 countries. He also loves going to concerts, movies, and musical theater performances. David Kaplan’s roots in the Jewish community run deep. His Gramma Betty, who lived a mile from this hotel when David was a young child, is pictured stringing cranberries and popcorn for the Mishkan Tefila Sukkah in a 1980’s Boston Combined Jewish Philanthropies calendar. He still hears his mother Shirley, of blessed memory, singing, “If I can’t get my favorite chopped liver, just man the lifeboats and I’ll cry me a river,” in a temple musical. Daughter Abby, a designer and writer in Austin, Texas, created her Bat Mitzvah tallis and kippah with her Grandpa George helping knot the tzitzit. Daughter Alyssa, Deputy Legislative Counsel for the State of California, played clarinet under the direction of Cantor Aryeh Finklestein and is fondly remembered for chanting the repetitive paragraph including, “shekel b’shekel haKodesh,” in Parasha Naso twelve times on her Bat Mitzvah just a few months after her mother, Phyllis had her adult Bat Mitzvah. Dad, George, has chanted haftarah Nachamu on each anniversary of his Bar Mitzvah starting with the 60th in 5752. David was introduced to Brotherhood by Gary Miller, who told him to show up at the next board meeting or else... Fifteen years later, David became club president. Mack Rosenbaum pushed him to attend The New England Region Retreat. The FJMC International Convention followed, and David found a group of men, who are, to this day, among his closest friends. David has a long and continuing involvement with the FJMC’s Keruv / (Understanding Intermarriage) initiative and has mentored congregational leaders and rabbis participating in the FJMC / Brandeis New Roads to Engagement program. He greatly enjoyed his term as New England Region president, and has co-chaired the FJMC’s region officers training program. David served many roles at Congregation Mishkan Tefila over the years, but mostly tries to show up for minyan a couple of times a week. David works with Aronson Insurance where he helps clients keep their wallets intact and where the staff makes him look good. Aaron Altman grew up in a tough German-Irish neighborhood in New Jersey, not far from the Lincoln Tunnel and where not too many Jews lived. Aaron’s parents were Holocaust survivors to whom all things Jewish – food, traditions, friends, education – were as essential as life itself. To his parents, it was crucial, and with no discussion, that Aaron go to a Yeshiva to study Torah, to be with other Jewish children, have Jewish friends and most of all to have a strong Jewish identity. This educational investment was Aaron’s Jewish foundation that still remains strong. After Yeshiva, he went to NYU and graduated with a degree in Economics/Political Science and Marketing. During Aaron’s career, he has worked for a number of European optical and photographic companies, primarily as head of their Sales and Marketing teams. Aaron started his own marketing agency, The Altman Group, and for the last eight years he’s partnered with international manufacturers who look to broaden their brand and distribution sales channels in North America. In 1999, Aaron and his beautiful wife Elayne moved with their two children, Michael and David, to Long Island, NY. He became a member of the Dix Hills Jewish Center and became very active with their Men’s Club. He chaired their golf outings for six years, raising over tens of thousands of dollars for the DHJC Men’s Club and other charities. In 2011, he became president of the DHJC club and brought the club into the FJMC NY Metro Region as a member. Aaron is quite active at the DHJC where he serves on the Board of Trustees and is 1st Vice President. He works with a number of DHJC committees - Education, Finance, Fund-raising – and has for many years chaired the Marketing/Communication committee, which is responsible for their newsletters, website, and social media. He is committed to the FJMC, where he serves on the NY Metro Regional Board. Aaron has twice chaired the NY Metro’s largest fund-raiser, their annual Awards Dinner, to record results both in attendance and revenue. He also has participated at several LDI retreats as well as the 2013 FJMC Convention. Understandably, of particular interest and passion, is Aaron’s participation with the FJMC Yellow Candle program. He feels this program is critical for future Jewish generations to both understand and remember the SHOAH. He also sits on a number of UJA committees such as SYNERGY, where both clergy and lay people meet to pragmatically discuss trending problems within Conservative Judaism and what practical solutions might be possible. Additionally, Aaron is a member of ELIJA, an umbrella organization of Jewish organizations who meet to find effective ways to attract unaffiliated Jews back to their sense of Judaism. The Rashi ethic, “Naked a man comes into the world, and naked he leaves it: he carries away nothing – except the deeds he leaves behind”, was ingrained into Aaron from his parents since he can remember. To Aaron, this honor of being selected the 2015 Ma'asim Tovim by his NY Metro region is humbling as it keeps with this ethic. He is most appreciative of this recognition, especially when he looks at the long line of very deserving past recipients. David Mandell is a Past President of the Northern New Jersey Region (NNJR), and currently serves as a member of the FJMC Executive Committee. He oversees the Operations Portfolio for the FJMC, as well as having served as the 2014 Chair of the Geffen Leadership Development Institute. Through his involvement in the Northern New Jersey Region, he was responsible for a wide variety of tasks and events, from chairing multiple “Man of the Year” dinners, to starting up a regional raffle, which has successfully raised thousands of dollars for the region and its clubs. He also initiated the regional district meetings which brought together the leaders in each of the region’s districts, to meet, brainstorm and learn together, forming communities within the greater NNJR community. Dave has been actively involved with Men’s Club for more than twenty years with the Men’s Club of the East Brunswick Jewish Center. He has twice served as the club’s President, in addition to holding numerous other positions for the club. He has served on his synagogue’s Board of Directors, holding multiple positions, including Ritual Committee Chair, IT Chair, and Trustee. He is a regular greeter at Shabbat morning services at the East Brunswick Jewish Center (EBJC), regularly leads services, and also chants Haftorah. In prior years, he stretched his talents in the Synagogue Theatre group, taking roles such as “Captain Bracket” in the production of South Pacific, and “Big Jule,” in the production of Guys and Dolls. Dave has attended seven international conventions. His first convention was in 2001 in Toronto, when Bob Levine, a past president of the Northern New Jersey Region and of the EBJC Men’s Club, was installed as International President of the Federation of Jewish Men’s Clubs. That convention, with the relationships formed with so many people, got him hooked on getting involved beyond the club level. When Dave isn’t doing work for Men’s Club, he is the Controller for Radiant Communications Corporation, a manufacturer of fiber optic components and systems. He and his wife Lois just celebrated their 28th wedding anniversary, and is the proud father of three girls: Jessica, a neonatal ICU nurse in Morristown, NJ; Lauren, a student at Middlesex County College; and Allison, studying at Rutgers University. For the past two decades, the Seaboard Region FJMC has had a secret weapon who has empowered its club leaders to be more effective communicators, and consequently more effective leaders. This same weapon supports Jewish men in living richer Jewish lives, bringing warmth and passion to his friendships, and making gatherings feel like homecomings. Whatever your mood was earlier that day, after spending time with our champion, Michael Freilich, the rest of your day will be better, guaranteed. Michael is a blue yarmulke recipient with a long résumé of service to FJMC. He has been a regional vice president, a brotherhood President, and is currently an advisor to the Seaboard Region. He has instituted Seaboard regional seminars to train the officers of various brotherhoods to be leaders and trainers. As an FJMC Consultant, Michael is known for his contributions in teaching using open-ended questions to assess the values and issues, and in small groups using the results to develop programming. In his heart, Michael is a teacher. He is active as a keruv advisor and has advised the innovative morning learners service at the last International Convention in Boston. Currently he is one of the editors for the FJMC portion of CJ Magazine and is a member of the International Board of FJMC. Michael’s substance comes from a base of an outstanding education and a continuing thirst for knowledge. He received his undergraduate degree from Columbia University where he also studied at the Jewish Theological Seminary. He then pursued graduate degrees in philosophy at The Ohio State University, studying with Professor Marvin Fox. While at Ohio State, Michael was a Melton Research Fellow and taught at the Melton Hebrew School in Columbus, Ohio. After completing his graduate work, Michael pursued his J.D. at the Case Western Reserve University. Michael has taught philosophy at The Ohio State University and at John Carroll University. For many summers, Michael was staff at camps Ramah including the Poconos, Nyack (when it was an overnight camp), Berkshires, Glen Spay, and Wingdale. Michael practices law in Baltimore. He is considered a tough trial lawyer and a strong capable transactional attorney. Michael and his wife Barbara recently celebrated their 48th anniversary, and have two children: son David, who resides with his family in Austin, Texas; and daughter, Honey who resides with her family in Rockville, Maryland. When he sees any one of his grandchildren, he lights up like the 8th day of Hanukah. Barbara is an investment advisor with Ameriprise. Both Michael and Barbara have been members of the International Kiddush Club since 2007. Michael’s courage, toughness, and humanity have inspired all of us in the Seaboard Region and the larger FJMC. Warren Sufrin has lived in Pittsburgh for most of his life. After graduating high school in three years, he lived on a kibbutz in Israel for six months where he learned Hebrew and worked. He then attended Boston University, graduating with a business degree in management information systems. During his junior year, he again went to Israel, attending Hebrew University. Warren worked in the information systems field for over 30 years. He is currently the Director of Information Technology at Jewish Family & Children’s Service in Pittsburgh. He also is an owner of Twin Property Solutions - a real estate business, involved in rentals and in improving neighborhoods by renovating run-down houses. Warren met his wife, Adele, at the Pittsburgh JCC in 1985. They were married in 1987 and now have two sets of twin girls: Ilana and Rena, recent college graduates; and Leah and Dana, incoming seniors at Binghamton University and the University of Pittsburgh. Warren has been involved in volunteer activities in the Pittsburgh community for many years. He currently serves as co-president of the Men’s Club at Beth El Congregation and has been the synagogue’s Recording Secretary, V.P. of Fundraising, V.P of Education and V.P of Administration. He is a former President of Bnai Zion, Pittsburgh Region and served on Bnai Zion’s national board. He is the former Campaign Chairman of the Tri-State Region of Israel Bonds and is now their Chairman of the Board. Warren also served on the board of Camp Ramah in Canada. Finally, Warren has been active in the United Jewish Federation of Greater Pittsburgh, having served on their Board of Delegates and on their Overseas Funding Committee. As past Regional President of Tri-State FJMC, Warren has a great love for our organization and the work they do in not just supporting Conservative Men’s Clubs, but also in the lead role it plays within the Conservative movement. He is humbled for having been chosen as a Ma’asim Tovim honoree and thanks all of his friends and family for being here, both from Pittsburgh and from the FJMC organization. Lew was born in Waterbury, Connecticut, having attended grammar and high school there and having had his bar mitzvah at Beth El Synagogue. He graduated from Columbia College and Columbia University School of Engineering and Applied Science, with respectively a Bachelor of Arts in 1955 and an engineering Bachelor of Science in 1956. While working in the United States Patent and Trademark Office in Washington, DC, he obtained his Bachelor of Laws degree from The George Washington University Law School in 1963. While serving in the Army from 1957 to 1959, he was stationed in Redstone Arsenal, Alabama (the focal point of the Army’s rocket and space projects, including development of the first U.S. ballistic missiles and space launch vehicles in the 1950s) where he was assigned to the Patent Division AOMC Legal Office. He moved to Los Angeles in 1963, passed the California Bar, and practiced as an intellectual property lawyer, including almost 23 years in the Patent and Licensing Office of Hughes Aircraft Company. He is in partial retirement in his sole law practice. Lew and his wife, Diane, joined Adat Shalom Synagogue in Los Angeles in 1976 where they immediately became involved with synagogue activities as well as with the Men’s Club and Women’s League, eventually with Lew serving as secretary and president, and Diane as president, among other positions. Lew also served on the synagogue board as secretary and presently alternates with a fellow Men’s Club member as shamus during services. He is also a member on the ritual committee, and is a leader in maintaining the daily minyan. He has been active in many Men’s Club activities, including the World Wide Wrap, Men’s Club Shabbat, Yom HaShoah Yellow Candle Program, Sukkah building and High Holy Day ushering. When Diane became president of the Elana Chapter of Hadassah, Lew became a Hadassah associate member; they traveled to Israel in 2012 to celebrate the Hadassah Centennial in Jerusalem. Lew also has been active in the Western Region FJMC, serving earlier as secretary and presently as Regional Administrator. He is active in other organizations, as well – in particular, Beverly Hills Lodge #393 of the Knights of Pythias, where he has served as an officer, mostly as secretary. He is also on the 60th Columbia College reunion committee for the Class of ‘55, to be celebrated in May, 2015. Lew has involved himself in photographing many synagogue and Knights of Pythias events, and several famous Class of ‘55 Columbia College reunions, inter alios. Lew and Diane, as of December 2014, have been married for 45 years. They have two daughters – Jessica, married to Steve, who live in the Big Island of Hawaii; and Sarah, married to Jerry, who live in Atlanta, GA (possibly moving to the San Francisco area). Sarah and Jerry have presented their parents with three granddaughters: Naomi, Alma and Liora. Lew feels very honored to have been selected to receive the Ma’asim Tovim honor.